« Take Your Baby to Work…Every Day? 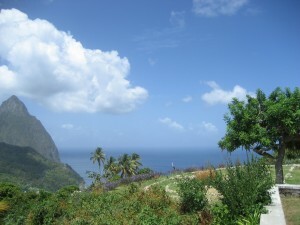 The last time I went someplace tropical was my honeymoon to St. Lucia in 2007! My older son, who will be staying with his grandparents, was such a high needs baby. I couldn’t imagine planning a trip like this with him. We’ll be dealing with a major climate change, a time change of two hours, and lots of unpredictable wedding events (like a sunset cruise!). But this baby? He goes with the flow. I know the time change will be crazy for him (and all of us…but tropical islands are great for napping!) and the site of the ocean might blow his wee mind, but I am bringing the ultimate baby-calmer with me: my bosom. Number Two Son is so chill, and even when he begins to fuss, he’s usually right as rain after a bit of nursing. We already know there aren’t a lot of paved roads on the Caye we’re visiting, which is fine since we aren’t stroller folks, anyway. I always prefer to tote my babies through the airport in a baby carrier, and this will make getting around the island easier for us, too. Another reason I love babywearing in unfamiliar situations is the ease of nursing when my son is already cuddled so close to my chest. Thinking back to the time change problem, if my son is taking marathon naps at 5pm when he thinks it’s bedtime, a baby carrier will be great for my husband and I to enjoy dinner without disturbing our son. I’m looking forward to carrying my son with me when we’re celebrating, nursing him to sleep right on my chest, and continuing to dance to help him stay sleeping. Of course, this means I can’t stay out all night or get smashed at the wedding…but I don’t really do those things anymore, anyway. I’ve been pregnant or nursing since October, 2008. The resort where we’re staying keeps a list of trusted sitters, but in the end we decided this will be more hassle than it’s worth. For starters, I’d have to either pack a pump on my vacation (no thank you!) or find time to pump before we leave, transporting fresh milk with me and keeping it cold through several flights and a boat ride. Better to bring our son with us on our evening excursions. We aren’t night owls; we barely stay up past 9. Our expectations for the trip are a little different than they would be if we were going just as adults. For a family trip, we’re looking forward to having no plans every day other than “go to the beach” and “nap.” Since our hotel room opens right out onto the sand, these goals should be easily accomplished! All that remains is settling upon the right dress for the occasion and thinking about the best swimsuit for nursing AND floating. Have you traveled abroad with your nursing baby? Leave us a comment to share your best tips!